Sciatica Pain Treatment In El Paso, TX. Sciatica Pain Treatment: It begins in the lower back and extends through the buttocks down the back of each leg to the thighs and feet. 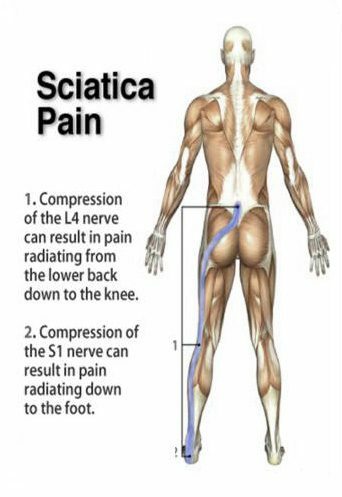 Sciatica is a shooting pain that begins in the lower back, radiates into the buttock and down the back of one leg. The pain is often caused by pressure on the sciatic nerve from a herniated disc, bone spurs or muscle strain. It improves with rest, physical therapy, and other self-care measures. If the pain is chronic then it may be helped with surgery. 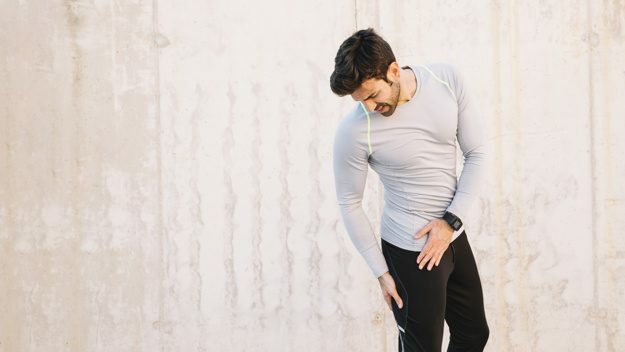 The most common of causes when the gel-like center of a spinal disc either bulges or ruptures through a weak area in the disc wall and compress the nerves. As discs naturally age they dry out and shrink. The small tears in the disc wall can cause pain. The facet joints enlarge and ligaments thicken. Tightening or spasm of the piriformis muscle can compress the nerve. Spinal stenosis is characterized by the narrowing of the bony canals within the spinal tract, which can place pressure on the nerves. This condition develops when weakness or stress fracture in the facet joints allow a vertebra to slip out of position and pinch the nerves. As it slips out of alignment it narrows the region which the nerve travels through. A sports injury or fall can fracture the spine or tear a muscle and damage nerves. LEG PAIN can also be caused by a joint problem in the hip or sacroiliac joint. This type of referred pain is common, but is not sciatica. Acute sciatic pain occurs suddenly and usually heals within several days to weeks. The severity relates directly to the amount of tissue injury. 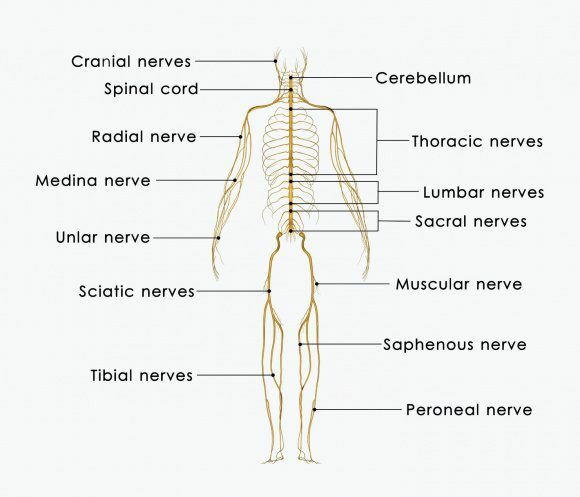 The source of pain may be in the spinal joints, discs, nerves, or muscles and ligaments. If chronic sciatic pain persists for more than 3 months, its source may be hard to determine. Chronic pain may be felt all the time or worsen with certain activities. Contributing factors may include nerve damage, tissue scarring, arthritis, or mental effects of pain. People with chronic symptoms may be referred to a pain specialist. The most common symptom is leg pain. However, the condition has a number of lesser-known symptoms. Difficulty moving the foot or leg/knee pain that worsens while sitting. Classic sciatic pain starts in the low back and buttocks. It affects one leg traveling down the back of the thigh, past the knee, and sometimes into the calf and foot. The pain feels worse in the leg than in the back. It can range from a mild ache to severe burning or a shooting pain. Numbness or tingling i.e. “pins & needles” can occur in your leg and foot. This usually is not a concern unless you have weakness in your leg muscles or foot drop. Sitting usually causes the most pain because of the weight this position puts onto the discs. Activities, such as bending or twisting, worsen the pain, whereas lying down tends to bring relief. Running or walking may actually feel better than sitting or standing for too long. Seek medical help immediately if you have extreme leg weakness, numbness in the genital area, or loss of bladder or bowel function. These are signs of a condition called cauda equina syndrome. A careful medical exam will attempt to determine the type and cause of the spine problem and treatment options. A diagnostic evaluation includes a medical history and physical exam. Sometimes imaging scans (e.g., x-ray, CT, MRI) and tests to check muscle strength and reflexes are used. Healing begins with self-care and nonsurgical strategies. The goal is to correct the problem, restore function, and prevent re-injury. Self care: Sciatica often resolves with rest, ice or heat, massage, pain relievers, and gentle stretches. Reduce muscle inflammation and pain using an ice pack for 20 minutes several times a day during the first 48 to 72 hours. Thereafter, a warm shower or heating pad on low setting may be added to relax the muscles. A short period of bed rest is fine, but more than a couple of days will do more harm than good. If self-care treatments aren’t working within the first couple of days, see a doctor. Medication: Over-the-counter non-steroidal anti-inflammatory drugs (NSAID’s), such as aspirin, ibuprofen or naproxen, can bring relief. A muscle relaxant may be prescribed for spasms. If pain is severe, an analgesic may be prescribed that can be taken with the NSAID or muscle relaxant. 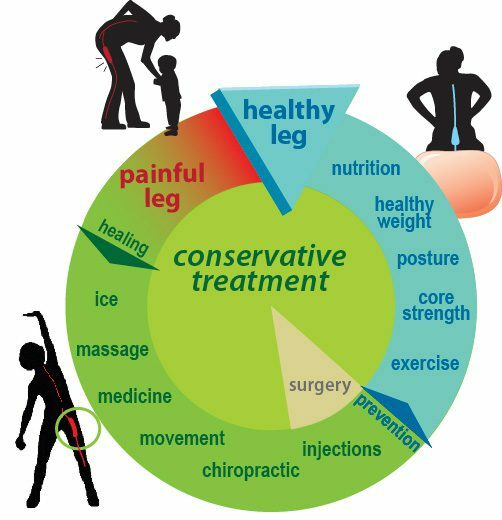 Physical therapy: For most leg pain, physical therapy can help you return to full activity as soon as possible and prevent re-injury. A physical therapists will demonstrate proper lifting technique, walking technique, and exercises to strengthen/stretch the lower back, leg, and stomach muscles. Massage, ultrasound, diathermy, heat, and traction can also be recommended for a short time. Patients may also benefit from yoga, chiropractic manipulation and acupuncture. Steroids can reduce the swelling and inflammation of the nerves. They are taken orally (as a Medrol dose pack) tapered over a five-day period or by injection directly into the painful area (see epidural steroid injections and facet injections). Steroids may provide immediate pain relief within 24 hours. Surgery: Surgery is rarely needed unless there is muscle weakness, a proven disc herniation, cauda equina syndrome, or severe pain that has not resolved after a course of nonsurgical treatment. Surgery for a herniated disc, called a discectomy, removes the portion of the disc compressing the spinal nerve. People with stenosis may benefit from a decompression of the nerves. A positive mental attitude, regular activity/exercise, and a quick return to work are all very important elements of recovery. If regular job duties cannot be performed initially, modified (light) duty may be prescribed for a time.